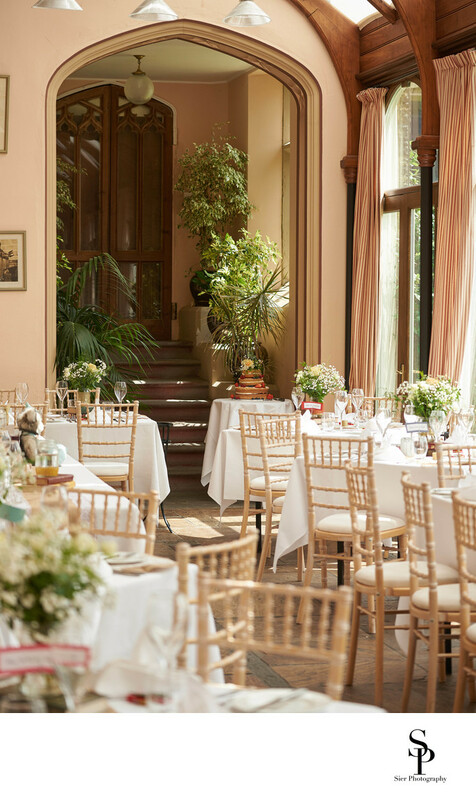 The magnificent orangery at Cressbrook Hall laid out ready for the wedding breakfast and reception at this superb and secluded Derbyshire wedding venue. This has to be one of the most uniquely situated wedding venues in the country tucked away well off the beaten track and high up on the hillside overlooking the River Wye down in Monsal Dale. This was our first visit to Cressbrook Hall and for anyone seeking this venue out make sure you consult a map before setting off. It is not that it is impossible to find but it just has such an unassuming entrance for such a grand hall that it is very easy to miss it. But when you do arrive what a treat awaits you! This is an unbelievably beautiful building, astonishing to look at and located amongst the most stunning of surroundings it takes your breath away. There are also a small number of cottages for the guests to stay in before and after the wedding located just a very short walk from the hall. For anyone wanting a wedding somewhere really different this is one to check out! 1/320; f/4.0; ISO 100; 86.0 mm.